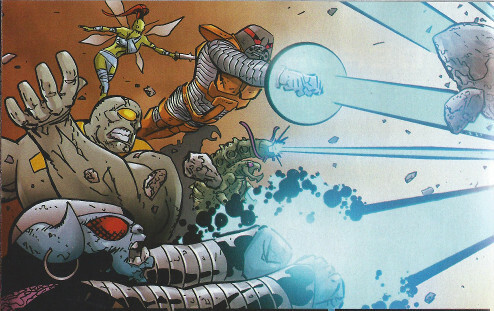 (Annihilation#2 - BTS / Annihilation#3 - BTS) - Annihilus deployed the assembled Centurions as a united strike team against the main force of heroes -- including Drax the Destroyer, Gamora, Nova (Richard Rider), Ronan the Accuser, former heralds of Galactus Red Shift and Stardust, among others -- opposing him on Daedalus 5, a system on the periphery of the Kree Empire. The Centurions assault broke the back of the resisting forces, effectively ending the military phase of the war. (Annihilation: Heralds of Galactus#2 (fb) - BTS / Official Handbook of the Marvel Universe A to Z hardcover#2:: Centurions profile) - Some of the Centurions questioned their involvement in the destruction wrought by the Annihilation Wave and began leaving Ravenous. (Annihilation: Heralds of Galactus#2 (fb) - BTS / Official Handbook of the Marvel Universe A to Z hardcover#2:: Centurions profile) - Ravenous set his own Centurion death squads against those Centurions who refused to serve him, killing at least three. 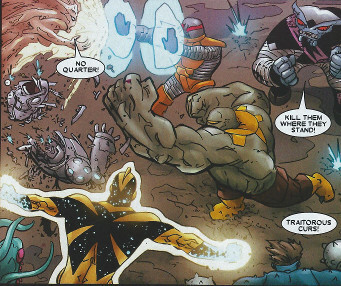 (Annihilation: Heralds of Galactus#2) - One of these Centurion death squads was present at the reception for Warlord Smyt, the Centurion ruling over Omina Prime. A group of disguised renegade Centurions -- including Hybalea and Torrent and perhaps 6 others -- also attended in disguise with the intent of taking down the corrupt Smyt and the Death Squad. The visor/eyewear member of the Death Squad detected the presence of intruders via a wrist sensor and announced their presence. As the renegades returned to their true forms, the Death Squad gathered in front of Smyt -- who urged them to kill the renegades where they stood -- and fought back; and the cyclopean member did just that, shattering a robotic renegade. 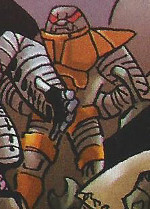 They were soon aided by an insectoid squad (see comments), and when Torrent fell under fire from members of the Death Squad and/or the insectoids, Hybalea was distracted by her loss, and Smyt smashed him across across the room. As the Death Squad gained the advantage over the renegades, Firelord burned a hole through the roof and confronted the Centurions, telling them to choose surrender or death. Refusing surrender and denying quarter, Smyt gathered his Centurions to the fore, and he struck down Hybalea when he urged him to stand down. Battling the combined power of Smyt and his Death Squad, Firelord slew the latter in a blast that destroyed the reception hall. (Annihilation: Heralds of Galactus#2 - BTS) - Injured, Smyt warned Firelord that Lord Ravenous would punish punish his treasonous actions, but Firelord apparently slew Smyt with his next blast. Comments: Created by Keith Giffen and Scott Kolins. At least one insectoid was present during the reception, and others rushed to the conflict and fought against the renegade Centurions. Or maybe they are remnants from the Annihilation Wave. Are they members of the Death Squad? Large (looked at least a foot or two taller than the apparently 7' tall Smyt) and strong, this guy shattered a robotic renegade Centurion with a single punch and then engaged the liquidenegade (punching her away after she tried to engulf him), followed by the spiked mace-handed renegade. When Firelord arrived and threatened the Centurions present, he awaited Smyt's command and then attacked Firelord. When Firelord blew up the reception hall, he was rendered unconsious if not killed. Firelord then apparently destroyed him while he still lay on the ground, insensate. The H'Zarri were once an advanced race reduced to hunter-gatherers by Annihilus. 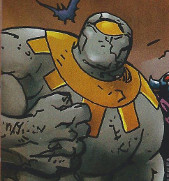 Also large and strong, this guy could also fly, form shields, and fire energy blasts. He looks somewhat robot, or at-least cyborg-esque. His wrist device alerted him of intruders when the incognito Hybalea and Torrent walked past. He, in turn, alerted the rest of the Death Squad. In the initial conflict, he formed shields from his hands to fend off the liquid-like renegade, and then fired on the molluscoid, tentacled renegade (who formed a shield to deflect this attack). When Firelord blew up the reception hall, he was stunned, though he remained on his hands and knees when the rest of the Death Squad were left prone. Firelord then presumably slew him before departing. She had paired wings that allowed her to fly and/or hover, as well as a pair of antennae; she appeared to have insectoid features, but she was only seen from a distance. She carried some sort of spiked or bladed weapon in her hand, although this was also seen only from a distance. She was not seen demonstrating any abilities in combat. When Firelord arrived and threatened the Centurions present, she awaited Smyt's command and then attacked Firelord. When Firelord blew up the reception hall, he was rendered unconsious if not killed (it's not clear from the distant image whether she is trying to lift herself up with her arms or not). Firelord then presumably slew her before departing.